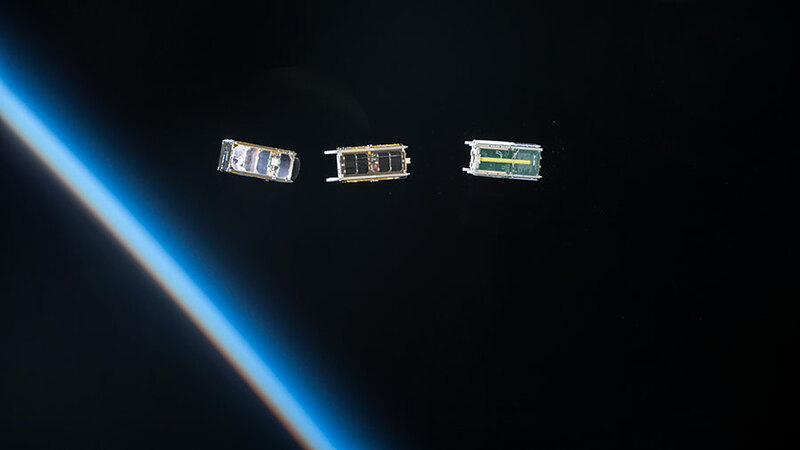 A trio of CubeSats, with Earth’s limb and thin atmosphere in the background, is seen shortly after being ejected from a small satellite deployer outside Japan’s Kibo lab module. More CubeSats were ejected from the International Space Station this week to explore the Earth’s upper atmosphere. Meanwhile, the Expedition 51 crew trained for a crew departure and cargo craft arrival. NanoRacks, a private company with facilities on the space station, deployed a total of 17 CubeSats over two days this week from a satellite deployer outside the Japanese Kibo lab module. The tiny satellites will orbit Earth for up to two years observing Earth’s thermosphere and studying space weather. Two Expedition 51 crew members are returning to Earth June 2 completing a 196 day mission in space. Soyuz Commander Oleg Novitskiy and Flight Engineer Thomas Pesquet practiced their descent today in their Soyuz MS-03 spacecraft. The duo are expected to land in Kazakhstan next Friday at 10:10 a.m. EDT. The Dragon resupply ship, from SpaceX and loaded with brand new science experiments, will launch June 1 and arrive at the station June 4. NASA astronaut Jack Fischer will be at the robotics controls commanding the Canadarm2 to reach out and grapple Dragon. He and station Commander Peggy Whitson familiarized themselves today with the Dragon capture procedures and lighting conditions inside the cupola.